Express yourself and have fun with Crocs! Crocs is one of the famous shoe brands in the world today. It started by selling simple and comfortable boat shoes and evolved over the years into a big brand selling more than 120 styles of shoes for children, men and women. The fashionable Crocs shoes are soft, lightweight, comfortable and odour-resistant and perfect for everyday use and formal use. With a wide collection across styles, Crocs’ online store is the right place to shop for shoes for almost any occasion. Moreover, the online store holds various Crocs promo offers and Crocs sales when the shoes are available at low prices. Explore the website of Crocs Singapore to find the shoes of your choice! Crocs was an innovation in the footwear industry owing to the revolutionary material “Croslite” used for manufacturing shoes. Because of the common nature of Croslite and crocodiles − they can survive both on land and in water, the brand was named “Crocs”. Based in Boulder, Colorado, Crocs was founded in the year 2002 by George Boedecker, Scott Seamans and Lyndon "Duke" Hanson. The company debuted in the name Western Brands at the Ft. Lauderdale International Boat Show by introducing their first model “The Beach”. It got a great response as all the 1000 pairs of shoes were sold out. Western Brands sold 76,000 pairs and generated sales worth 1.2 million in the first year. Western Brands saw immense success after its start. In 2005, the company launched its first marketing campaign to reach a wider audience. It also rebranded itself to Crocs in January 2005. In 2006, Crocs planned on designing new models of shoes and introduced the Crocs store concept. Also, in the same year, the company went public and increased the global distribution of its products. Crocs offers a wide variety of shoes in myriad styles for men, women and kids. You can shop for Crocs slippers, Crocs sandals and other styles at low prices during a Crocs sale. A great collection of office wear and casual wear shoes that suit different styles and tastes awaits you at the online store of Crocs Singapore! Women: The collections Isabella, LiteRide, Fuzz and Work have shoes to suit different occasions and styles of dressing. Also, with the amazing collection of women’s clogs, flip flops, sneakers and wedges, you are sure to find that perfect pair of shoes! Use your Crocs voucher code to get a discount on your purchase. Men: Apart from everyday wear loafers, sneakers, slides and flip flops for men, Crocs also has a great collection of formal shoes to wear to work. The Big & Tall collection of shoes is specially designed for boys aged 14 and more. The collection includes fashionable clogs, slip-ons, loafers, flip flops and sandals. Girls: For all the young ladies, Crocs has attractive clogs, flip flops, boots, flats and other styles of shoes to offer. The Characters collection has fashionable and colourful shoes featuring cartoon characters. Also, Jibbitz Shoe Charms is a collection of embellishments for your shoes. These come in categories such as emojis, letters, number and super heroes. Boys: Crocs is the go-to place to buy any style of shoes for boys. Boots, sneakers and sandals are among the boys’ products at Crocs. You can buy your favourite pair of shoes at a discounted Crocs price by using a Crocs promo coupon or Crocs discount coupon. How to Shop at Crocs? 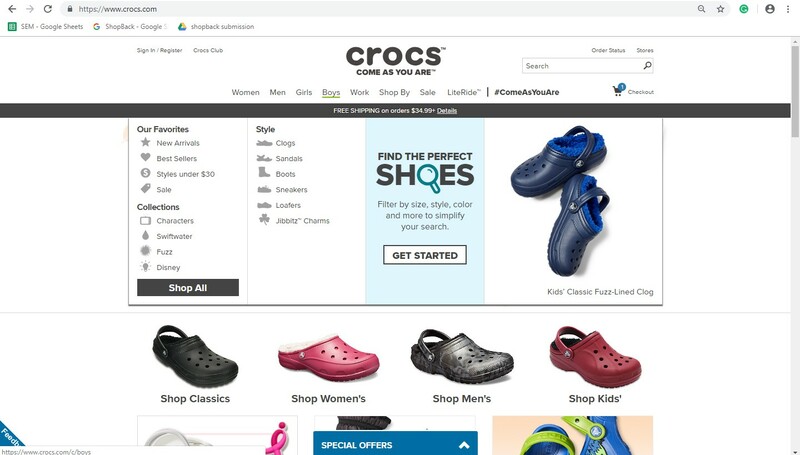 Crocs has an easy-to-use website and a simple checkout process to give you a pleasant experience of shopping. The homepage displays all the categories of products which makes it easy for you to find the product of your choice. Browse through the categories, select any type of shoes and follow the process given below to make the purchase. Step 1: Browse through the product listing page and click on a product to purchase it. Step 2: Select a colour (if choice available) and size and click “Add to Cart”. Step 3: Click “View Cart & Checkout” if you have finished shopping. Alternatively, you can click “Continue Shopping” and shop for more items. Step 4: If you wish to make payment through PayPal, click “Check out with PayPal”. Otherwise, click “Checkout”. You can also enter your Crocs promo code or Crocs discount code in the space provided on the web page. Step 5: Enter details such as the shipping and billing addresses, choose the shipping and payment methods, enter the payment details and click “Place My Order”. Crocs offers multiple payment options, so you can purchase your favourite products without any hassles. Credit Cards: Crocs accepts payments through major credit cards. You can pay from your Visa, Mastercard, American Express or Discover credit cards and to do this, you must choose Credit Cards as the payment method on the checkout page. PayPal: Choose PayPal as the payment method on the checkout page and click “Pay with PayPal”. You will be directed to a different web page where you must log in to your PayPal account. Payments made with PayPal are easy and secure. To make shopping all the more exciting, Crocs brings you special offers on crocs, boots and other shoes when you can get a discount. A Crocs voucher can get you great deals on your favourite pair of shoes. Check out the online store for updates about Crocs sales and Crocs codes. 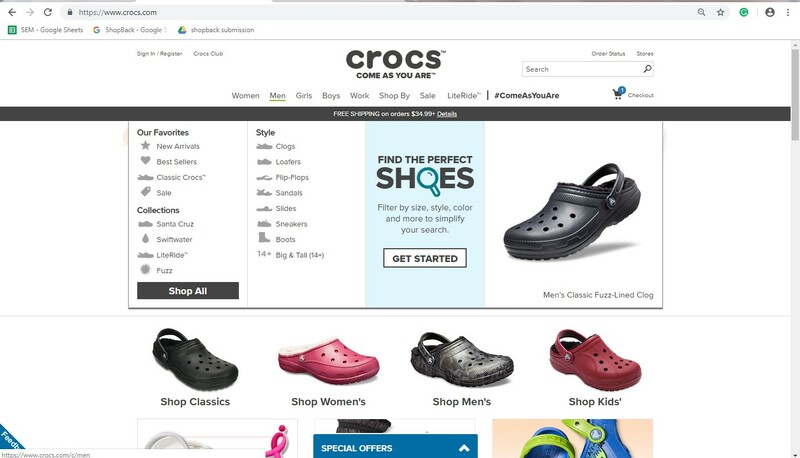 Navigate to “Sales” present on the homepage and get details on the current offers and deals at Crocs. 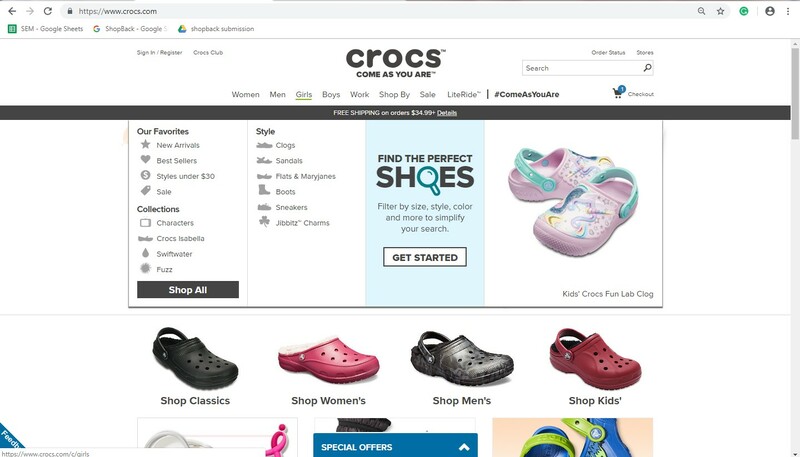 Also, by clicking on the “Special Offers” drop-down present at the bottom of the window, you can learn about the current offers at Crocs. How to Redeem Coupons and Vouchers at Crocs? You can avail great Crocs deals during a Crocs promo sale. Crocs discount vouchers are available during this time and you can use them to buy the products at low prices. The process of redeeming a Crocs coupon is very simple. Step 1: Browse through the product categories and select a product. Click “Add to Cart” to buy it. Step 2: Check out by clicking “View Cart & Checkout” in the pop-up. Step 3: In the shopping cart page, under the products list, enter the coupon code under “Promo or coupon code” space. Click “Apply”. Step 1: On the homepage of ShopBack, click on the Fashion tab. Step 2: Click “View all Fashion Stores” to get the list of all the fashion stores available on ShopBack. Step 3: Select Crocs from the list. Step 4: Click the “Activate Cashback” button present on the left side of the web page for Crocs. Step 5: Click “Continue to Crocs” to visit the official website of Crocs for shopping. Step 1: Go to the Contact Us section at the bottom of the homepage and select Customer Services. Step 2: On the left side of the web page, click “Order Status”. Step 3: Enter the order number and last name and click “Go”. Step 2: On the left side of the web page, click “Returns”. The customer service centre at Crocs is available from Monday to Friday, 8 AM to 5 PM (SGT) to serve you. To talk to the customer service centre, you can call on 6499 9634. To send an email, click the Contact Us link present at the bottom of the page. Click “Send Email”, enter your details and query and click “Send”. To connect to Crocs through social media sites, you can follow the links below.